Via a friend of a friend, he was riding behind this rider when he heard a loud crack, the rider was OK, no further info at this point. This bike has an MSRP of $7700, we are in a recession, who can afford this type of money for a disposable bike? That's a lot to spend on a mtn bike frame. Carbon fiber and mtn bikes never seem like a good combination to me. If I was sponsored and supplied the frame maybe. But I still wouldn't ride it on certain terrain. I just got this exact bike! I hope mine doesn't fail like this. PS no I didn't pay full retail for it. I would really like to know how often this really happens % wise. 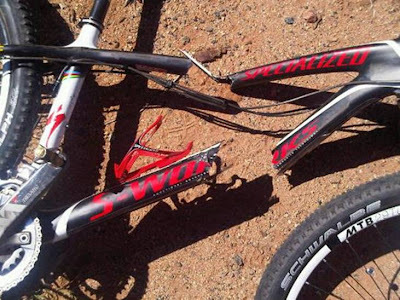 Hello Specialized?